for a silo flange diameter of 250 mm. Innovative water injection technology and durable materials makes this the perfect silo mixer for your construction site. Expand your flexibility and range with the MAI®2MIX-MAIA universal mixer. Patented mixing blades guarantee perfect homogeneous mixing and processing quality for top results on your project. It has a maximum mixing capacity of up to 40 to 80 l/min with a maximum grain size of 6 mm (or up to 8mm although this may lead to increased wear) for a silo flange diameter of 250 mm. This is the optimal universal mixer for the dry mortar industry. 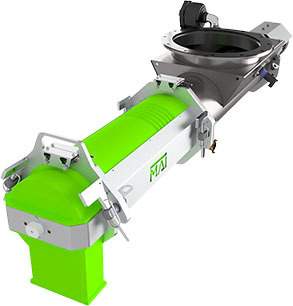 The MAI®2MIX-MAIA-XL is the industrial silo mixer for when a larger mixing capacity is required, with a maximum of 40 to 150 l/min and a grain size of 6mm (or up to 8mm although this may lead to increased wear) for a silo flange diameter of 350mm. Perfect mixing quality every time. 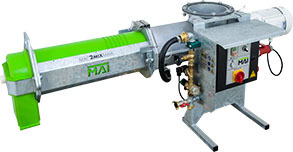 When your construction project needs a horizontal continuous flow silo mixer, turn to MAI for professional, long lasting machines that continuously process dry pre-mixed mortar into a workable compound. MAI silo mounted continuous mixers are perfect for mixing pre-blended mortar products such as masonry mortar, adhesives, EIFS, plaster, stucco, self-levelling underlayment, refractory materials, masonry and grout. Just set the water flow rate for your specific material and the MAI® silo mixer automatically does the rest. A MAI silo mixer is ideal for large grout and mortar jobs and comes in a range of setups for different levels of capacity. Expect rugged performance and easy maintenance with durable components. Each mixer in the MAI range provides our valuable customers with a smooth, uniform, high-quality mix that is easy to handle. 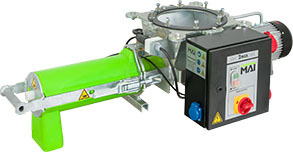 MAI continuous mixers are also easy to clean and easy to operate. Find out more about the MAI continuous silo mixer range by talking to the team of experts at this world-leading mortar mixing technology supplier. The MAI®2MIX-LYRA-PICCOLO is an industrial continuous silo mixer for fine materials, providing the highest mixing quality, every time. It has a maximum mixing capacity of up to 25l/min and a maximum grain size of 4mm for a silo flange diameter of 250 mm. Innovative water injection technology and durable materials makes this the perfect silo mixer for your construction site.